Serve Alabama is excited to announce the ninth annual Be Ready Camp. The application process is underway. This camp, hosted at the U.S. Space and Rocket Center in Huntsville, AL, provides an opportunity for sixth graders across the state to become Youth Preparedness Delegates, receive a commendation from Governor Robert Bentley, and carry the message of preparedness and safety to their schools, communities, and families. This camp has been featured in international Homeland Security journals and received national media attention, including coverage for the Cable News Network (CNN). Additionally, the camp is considered a best practice by the White House and the U.S. Department of Homeland Security. Be Ready Camp is an innovative and unique program that promotes citizen preparedness and participation to sixth graders in Alabama using multiple approaches to learning. 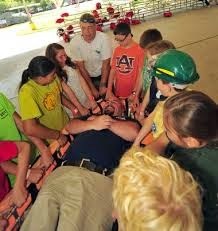 Be Ready Camp utilizes a modified Community Emergency Response Team (CERT) training as its foundation and broadened to include additional lessons. Be Ready Camp curriculum includes: emergency preparedness, introduction to survival and first aid, developing an emergency kit, creating a family disaster plan, water survival, light search and rescue, disaster psychology, triage, career exploration, and terrorism awareness. Throughout each lesson, the participants have the ability to demonstrate their knowledge with hands-on demonstrations in addition to traditional assessment. The camp concludes with a mock disaster, where the youth perform victim search and rescue alongside professional responders in a realistic setting. The participants are tasked with bringing the message of preparedness and what they have learned to their families and their communities. When and where will Be Ready Camp take place? Be Ready Camp will be held at the U. S. Space and Rocket Center in Huntsville, Alabama Tuesday, March 24 – Saturday, March 28, 2015.
Who is Eligible to Attend Be Ready Camp? All Alabama residents who will be in the sixth-grade by September 2014 are eligible to attend Be Ready Camp. What is the Cost of Attending Be Ready Camp? Once selected, registration for Be Ready Camp is $75, which includes lodging, meals, and a CERT backpack. It is the responsibility of the participant’s parent/guardian to provide transportation to and from Huntsville, Alabama. The selection process for Be Ready Camp is open to all Alabama residents who will be in the sixth grade by September 2014. Applicants must submit a 300-500 word essay answering the question, “What impact can a disaster have on my community, and what can I do to prepare for and respond to a disaster?” Please clearly label all submissions with name, address, telephone number, county, and school and include a note from the parent/guardian permitting child to attend. Submissions are due by January 31, 2015. Please contact Brooke Mills at 334-954-7456 or BeReadyCamp@ServeAlabama.gov for more information.